2020 could be a very sad year for West Norfolk. 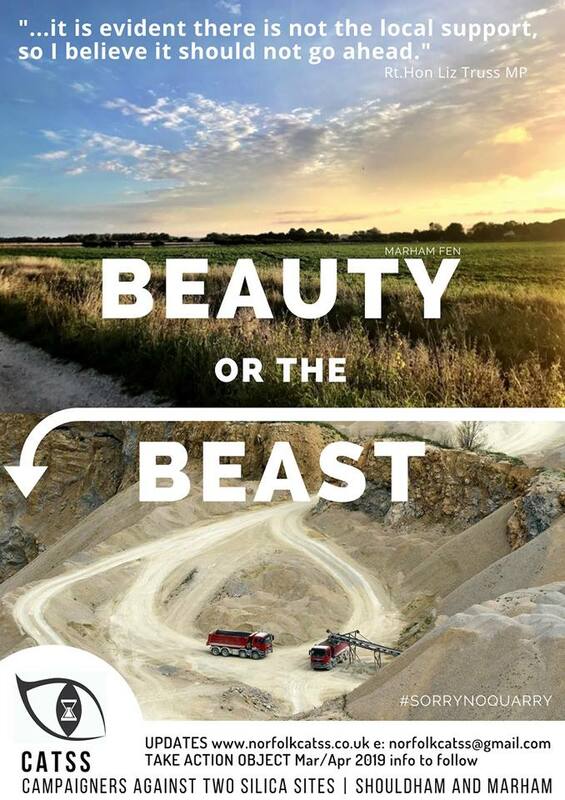 Unless, everyone acts now to stop Sibelco and the Norfolk County Council creating the largest Silica Sand extraction quarry in the UK - it really will be a Beast. 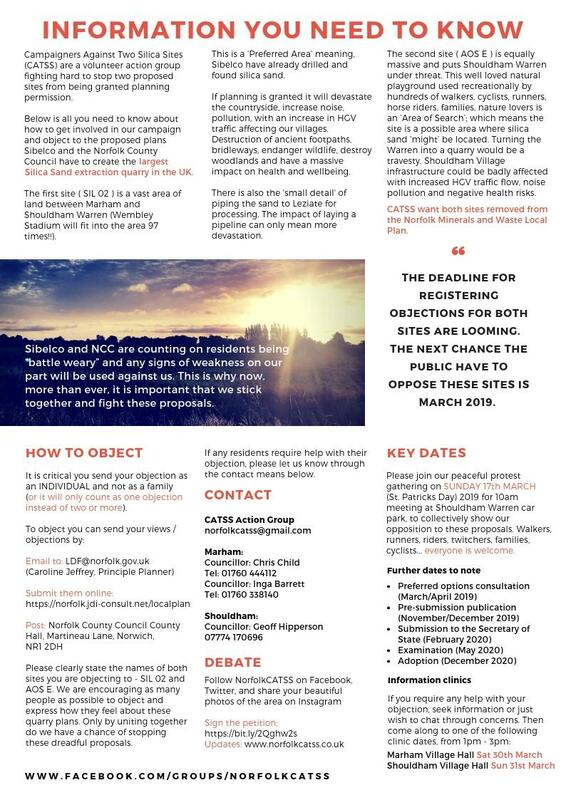 CATSS (Campaigners Against Two Silica Sites) a volunteer action group are fighting hard to stop two proposed sites from being granted planning permission. The first site (SIL02) is a vast area of land between Marham and Shouldham Warren (Wembley Stadium will fit into the area 97 times!!). 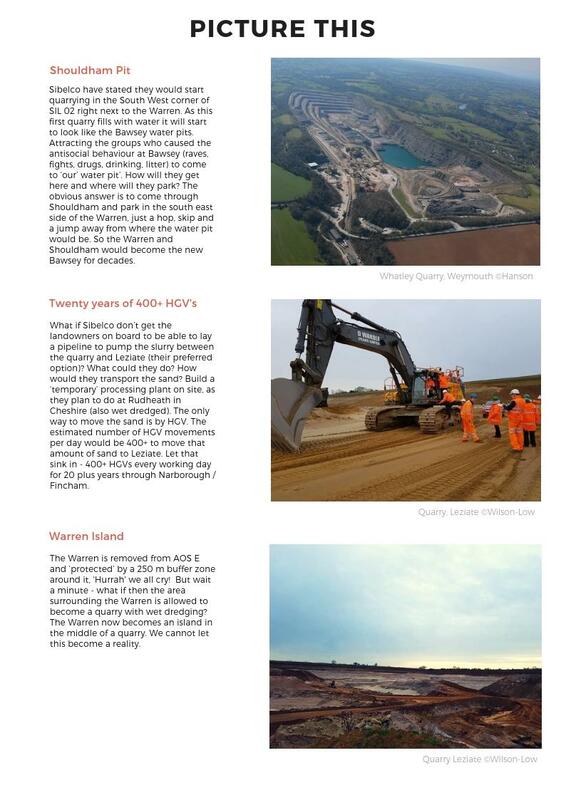 This is a 'preferred Area' meaning, Sibelco have already drilled and found silica sand. 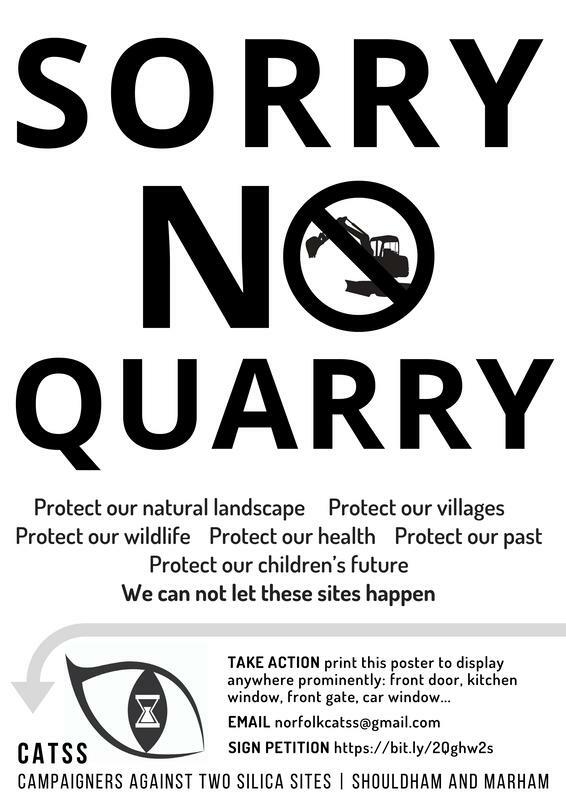 If planning is granted it will devastate the countryside, increase noise, pollution with an increase in HGV traffic affecting our villages. Destruction of ancient footpaths, bridleways, endanger wildlife, destroy woodlands and have a massive impact on health and wellbeing. Not to mention the 'small detail' of piping the sand to Leziate for processing. 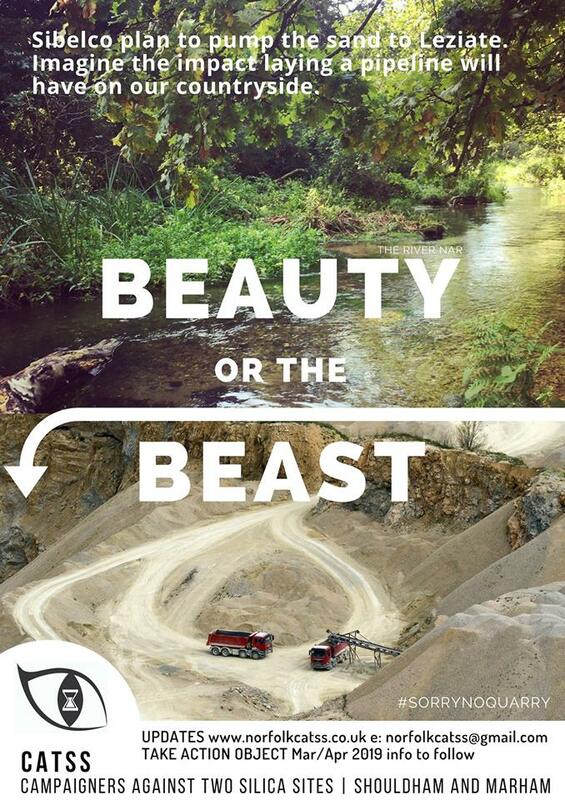 The impact of a laying pipeline can only mean more devastation. The second site (AOS E) is equally massive and puts Shouldham Warren under threat. This well loved natural playground used recreationally by hundreds of walkers, cyclists, runners, horse riders, families, nature lovers is an 'Area of Search'; which means the site is a possible area where silica sand 'might' be located. 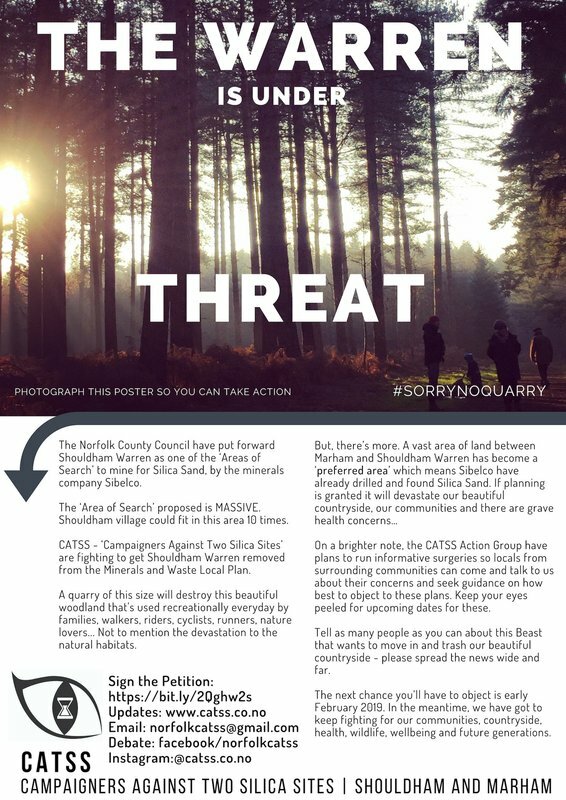 Turning The Warren into a quarry would be a travesty and impact terribly on Shouldham Village. CATSS want both sites removed from the Norfolk Waste and Mineral Plan. 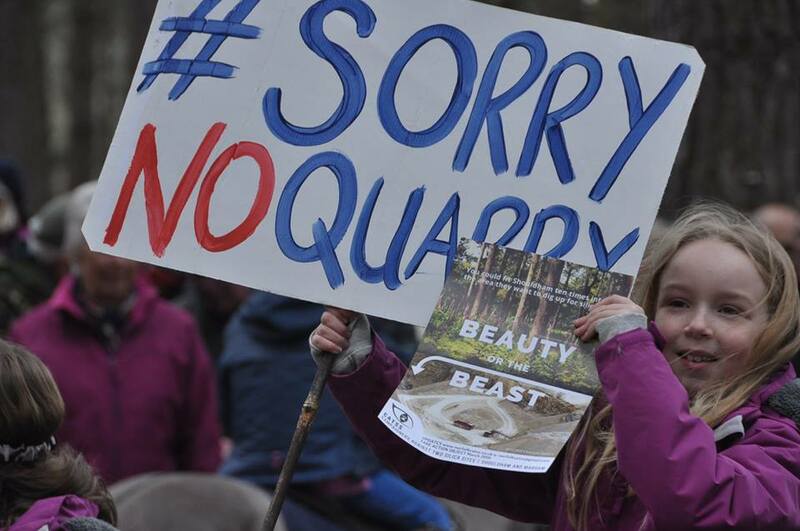 "...it is evident there is not the local support, so i believe it should not go ahead."